This strip is a reply to Scientist! Hanzo's going for the big bad samurai who are holding up a small farming village in Yotsuya with potential orders to kill him on sight. He knows this because his pal - the shogun - Ieyasu told him via ninja-express. So he seeks knowledge from an old-time friend. 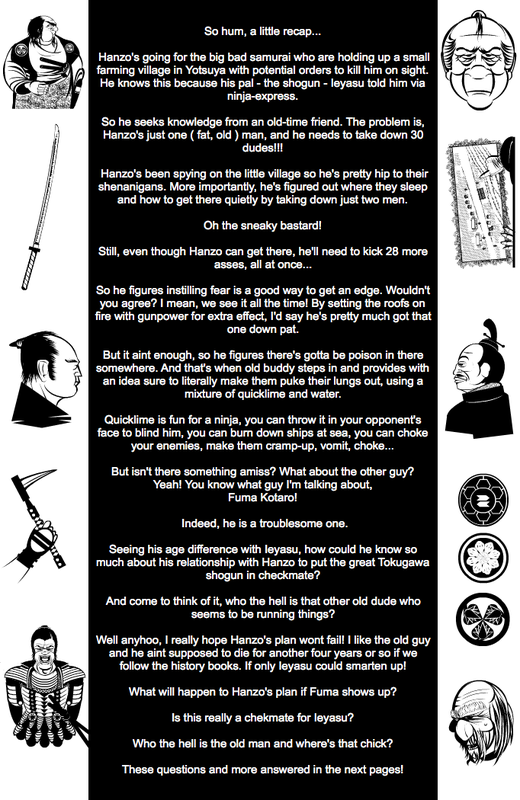 The problem is, Hanzo's just one ( fat, old ) man, and he needs to take down 30 dudes!!! Hanzo's been spying on the little village so he's pretty hip to their shenanigans. More importantly, he's figured out where they sleep and how to get there quietly by taking down just two men. So he figures instilling fear is a good way to get an edge. Wouldn't you agree? I mean, we see it all the time! By setting the roofs on fire with gunpower for extra effect, I'd say he's pretty much got that one down pat. But it aint enough, so he figures there's gotta be poison in there somewhere. And that's when old buddy steps in and provides with an idea sure to literally make them puke their lungs out, using a mixture of quicklime and water. But isn't there something amiss? What about the other guy? Indeed, he is a troublesome one. Seeing his age difference with Ieyasu, how could he know so much about his relationship with Hanzo to put the great Tokugawa shogun in checkmate? And come to think of it, who the hell is that other old dude who seems to be running things? Well anyhoo, I really hope Hanzo's plan wont fail! I like the old guy and he aint supposed to die for another four years or so if we follow the history books. If only Ieyasu could smarten up! What will happen to Hanzo's plan if Fuma shows up? Is this really a chekmate for Ieyasu? Who the hell is the old man and where's that chick? These questions and more answered in the next pages!